Ask leaders about a major organizational change they’ve initiated, and they will usually light up. The passion comes through in their voice, their expressions, their animation. Not every leader of change is a firebrand – their style can be very low-key. But the deeply-felt passion is always there. That’s because without it, major change doesn’t happen. Nobody transforms anything if they’re lukewarm about the process, or about the end result. Some people who drive change find the process exhausting, or frustrating, or irritating – they are all about the result, about getting to the other side of the bridge they’ve built. Others are more patient with the journey, and sometimes that’s helpful to bring people along in the process. There’s a range of styles, and some changes demand more patience and longer timelines than others. Passion alone is not enough – you also need vision, perseverance, industriousness, and, often, a bit of luck. But without passion, nothing moves. It’s the fuel. This morning I attended a fundraiser which happened because of passion. Crossroads International is an international development organization which has been part of my life for over two decades, and in the past few years it’s gone through enormous changes. I sat on the board when many of these ideas were germinating, and this morning I attended a fundraising breakfast where it was clear how much they’ve sprouted and grown. It’s such an amazing experience to attend an event which would not have been remotely possible a few short years ago – and to see people reach for their wallets when asked to do so (because passion needs to be supported with money!). And all because of the passion we all have for the organization, and the passion a smaller number had to move it in an incredibly positive direction. Crossroads does great work with girls and women, and often I get the chance to hear directly from our partners in developing countries about their work empowering girls, advocating for women’s democratic rights, developing youth entrepreneurs… It’s always incredibly inspiring, reminding me of what’s possible, and what’s important. If you are looking for some inspiration of your own, and you missed the breakfast (maybe next year? ), listen to Malala Yousafzai, who’s nominated for the Nobel Peace Prize. If you’re in Canada or elsewhere, the CBC has an interview with her here. If you’re in the US, Jon Stewart’s interview with her is amazing. Her passion is clear and it’s taken her incredible distances. It’s building a movement. If you’d like to talk about how we can help you move your organization in the direction of your vision, please get in touch. UPDATE: During March of 2014, I’m involved in fundraising for Crossroads for programming for women and girls. If you’d like to support it, or you’re just curious about the campaign, please check it out here. 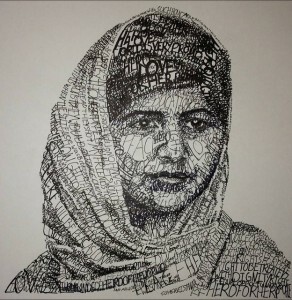 Image of Malala Yousafzai by Michael Volpicelli via Creative Commons. I’m so pleased you found this. Thanks so much for the use of your artwork; it’s really fantastic.